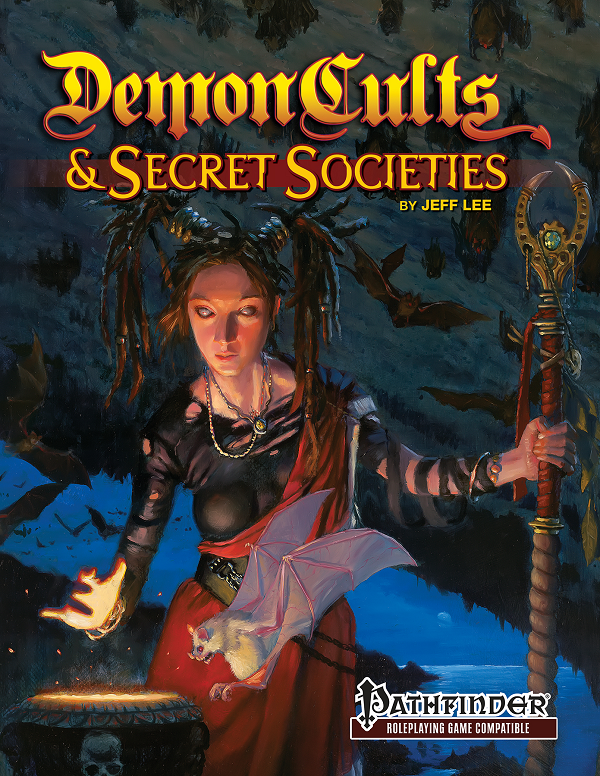 Out of stock: "Demon Cults & Secret Societies for Pathfinder RPG (Print)" doesn't have sufficient quantity in stock. New cult-related artifacts, spells, magic items, feats, monsters, vehicles, and more! Great campaigns need worthy villains. Discover conspiracies, plots, and mayhem to thrill and entertain your players for years! The PFRPG-version of the massive Demon Cults & Secret Societies book clocks in at 214 pages, 1 page front cover, 1 page editorial, 1 page ToC, 2/3rds of a page SRD, 1 page back cover, leaving us with 209 1/3 pages of content, so let’s take a look! Okay, so I’ll actually start the review of this book by covering the final chapter first – in it, we discuss the antipaladin class in a way that is actually helpful – we begin with a brief summary of how to handle the fall from being a paladin to becoming an anitpaladin – as the book astutely observes, the personality structure of the paladin is, paradoxically, closer to its evil mirror than e.g. a regular or more moderate foot soldier would be to becoming a champion of darkness. This goes two ways, though, and similarly, an antipaladin’s road to redemption, though significantly less often depicted in gaming (in fact, I couldn’t name one example at the top of my hat), is definitely one that deserves consideration. We also discuss perhaps one of the most underutilized class features EVER, namely plague bringer. While theoretically interesting and wide open, the lack of clarification of how disease vectors spread has left this ability somewhat hamstrung in the eyes of many players and GMs, also courtesy of the general design and rules-paradigms of PFRPG. As such, this section provides some clarification for spreading pestilence without slowing the game unduly. The pdf also provides an array of new antipaladin cruelties. These include scaling bleed damage, dropping anything carried in the hands or spellcasting hampering…and, e.g., forgetting the last round. At higher levels, we get halted fast healing/regeneration, temporarily phasing out of existence or losing ALL energy resistance and DR, all SR, being temporarily petrified…or, at 18th level, dying if the target has less than 100 hp. There are some problems here, namely the clear codification of offense-options. The spellcasting hampering option, for example, is flavor-wise clearly a pain effect, but is not classified as such. The kill-if-below-100-hp cruelty should definitely be a death effect and as such, preventable. Petrification should be classified as a transmutation effect…you get the idea. It’s not that the cruelties are bad, it’s just that their interactions with defensive tricks RAW bypass immunities and defenses they should not bypass. The pdf also contains a total of 8 different antipaladin archetypes: The Bloodwarg replaces spellcasting and the derived ability to use spell-trigger and spell-completion items, with wild shape. Fury knights follow the same design-paradigm, but get rage at -3 class levels instead. The Deathbolt Master replaces touch of corruption with a 30 ft.-range ranged touch attack that may deal damage or heal undead, but pays for this flexibility with decreased damage – only 1 per class level. The goremaster does not add Cha-mod to atk when smiting, but instead inflicts + Cha-mod as bleed damage when smiting. They are locked into the new bleed damage-causing cruelty, and their channel energy is based on d4s instead, but also inflicts minor bleed damage. When casting a spell classified as Blood Magic, as per the Deep Magic book, they increase their CL by 2 and the DC by 1. At 8th level, targets within 10 ft. take +50% bleed damage; this excess bleed damage is gained as temporary hit points, replacing aura of despair. Knights of hellfire are LE and replace fiendish boon with scaling, modified summon monster SPs, usable Cha-mod times per day. Thankfully, only one such effect may be in effect at any given time, preventing annoying battle-field flooding. Aura of despair is replaced with darkvision and poison immunity and 9th level’s cruelty is replaced with a cid and cold resistance 5, fire resistance 10. 11th level yields perfect sight in any darkness and telepathy with a range of 100 ft., replacing aura of vengeance. 15th level provides immunity to fire as well as acid and cold resistance 10 and his attacks count as lawful and evil instead of the usual cruelty. 20th level provides a devil apotheosis. The knight of many eyes, in contrast, would be an antipaladin devoted to the squirming things from the dark tapestry. Instead of fiendish boon, we get a tentacle attack (alas, not codified re primary/secondary, requiring defaulting) and eyes that prevent flaking, darkvision as well as a scaling chance of ignoring critical hits and precision damage from sneak attacks. Minor complaint regarding formatting: Reference to armor special abilities have not been properly italicized in the abilities. Higher levels add grab to the tentacles and add more tentacles gained. The capstone, unsurprisingly, would be an aberration apotheosis. The third knight-based archetype is basically a palette-swapped knight of hellfire: The knight of the abyss is, design-paradigm-wise, akin to its infernal brethren, just replaces the minor, defensive abilities gained with ones that are more in line with a demonic leitmotif. Finally, the plaguebearer gets Heal as a class skill, is locked into the plague cruelty at 3rd level and at 5th level, replaces fiendish boon with an upgrade to the disease DC as well as immediate onset, making it more immediately useful in combat. Instead of aura of despair, the archetype gains the new Corrupting Smite feat, which adds a free cruelty to the first attack that hits and is executed against a target of your smite, with a Fort-save DC based on class level and Cha to negate. 11th level replaces aura of vengeance with another new feat, namely Channeled Cruelty. This feat nets you the ability to channel at half damage, but add a cruelty to the effect, with successful saves negating the channel altogether. 14th level replaces aura of sin with a +2 insight bonus to atk and damage versus diseased targets and 17th level nets DR 5/good as well as a penalty to saves versus diseases for nearby targets. The capstone yields further DR-increase as well as the option to afflict targets of smite with all plagues; same goes for channel, but at no damage instead. I like the theme of this fellow, but considering the amount of creatures immune to disease, it would have made sense to have some option to at least temporarily negate that. The chapter also contains 7 spells, which include asking a spirit questions by delaying its departure from this plane, a charm person variant that only works against those affected by a fear-condition (including a mass version) and there is a death knell variant that also conjures forth a cockroach swarm. One spell sickens a target that is wounded sans save (and, as a litany spell, it can’t be combo’d with other litanies). There is a spell that temporarily lets a target detect as evil for the purposes of spell interactions sans forcing alignment changes and there is a better coup-de-grace type of spell that nets temporary access to 1 spell or SP with a casting time of 1 standard action or less of the deceased target. Personally, I think the spell should have a cap on the HD of the creature it can affect. The pdf also provides an array of feats for antipaladins beyond those I already covered above. One nets the option to make a touch of corruption-based short-range aura, one imposes a -4 penalty to saves versus the antipaladin’s spells and SPs to targets of smite. Interesting: Use two uses of smite good to smite an evil target as though good – makes sense to me. High level double-cruelty inflicting also makes sense, And there is an option to expand auras as well as a +2 DC increase for cruelties. Now, Fast Corruption is a feat I would not allow in all my games, as it allows the antipaladin to execute touch of corruption as a regular attack, which makes the class feature behave rather nova-like. I liked the Misleading Aura, which fortifies against detection. Two feats allow for the combination of touch of corruption and cruelties with unarmed attacks. Finally, there would be Personal Sacrifice, which is pretty potent, as it allows you to accept 2 points of burn to use smite good/evil sans expending a daily use. Similarly, touch of corruption or lay on hands may be sued for 1 point of burn sans expending a use. The feat does have a problem regarding its rules-interactions: The kineticist’s burn is governed by CHARACTER level, whereas the feat erroneously references CLASS level. That should definitely be character level, otherwise the whole burn engine becomes wonky. The chapter closes with a CR 7 and CR 14 sample antipaladin. Okay, so this concludes the antipaladin appendix of sorts, so let’s dive into the respective cults, shall we? Now, organization-wise, each of the cults comes with detailed write-up of its basics regarding organization and goals and the respective leaders are depicted as fully realized NPCs, often with gorgeous artworks. Beyond the named NPC movers and shakers, each of the cult-write ups also features stats for rank and file members of the cult, monsters, if applicable, as well as supplemental material, which depends on the respective cult, but generally represents crunchy bits. Now, as these rules-relevant supplemental materials are clearly intended for use by the antagonists of the PCs, I will judge them as such. Now, if I were to just list each individual statblock herein, we’d bloat this review beyond any immediate usefulness, so I’m taking the broad view here. It should also be mentioned that each of the cults comes with a suggested campaign/adventure-sequence outline of sorts, allowing you to plan the involvement of the cult as appropriate to the APL of your party. These outlines deserve special mention, as they’re often rather creative and interesting – and they make the GM’s job easier, so kudos there. It should be noted, though, that these are OUTLINES, not fully realized encounters or campaign plots – they are a suggested skeleton of a plot that you can weave into your game. It should be noted that none of the cults make use of the fame/reputation-mechanics, as they are intended as antagonistic organizations and not as cults for the PCs to join. 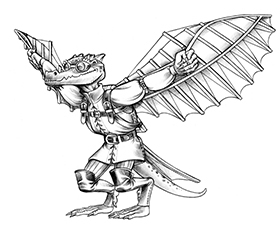 Fans of Midgard will appreciate the tie-ins of lore for the respective cult entries to the lore of the evocative setting, and, indeed, while the cults can be used in pretty much every setting, they benefit greatly from the tie-ins with Kobold Press’ cult fantasy setting. That being said, some of the cults with deeper ties to Midgard instead come with notes to use them in other settings, which will be appreciated by quite a few readers. All right, got that? As the following pertains some SPOILERS regarding the nature of the cults in question and their themes and arsenals, I strongly suggest that players should jump ahead to the conclusion. All right, only GMs around? Great! The first cult would be a classic of sorts for many gamers – the Black Goat’s Flock is classic Cthulhiana, depicting a cult of good ole’ Shub-Niggurath, as seen through the lens of Midgard’s brand of dark fantasy: the cult attempts to reassemble the Veridian Codex, an attempt codified, rules-wise, the fully statted spellbook of one of the movers and shakers of the cult. The cult comes with 3 spells, the first of which would be the curse of formless shape, which makes you amorphous and socially not acceptable, hampers movement and prevents holding items etc. ; Morphic flux is a high-level buff that fortifies against crits etc., grants all-around vision and nets you a slam. Selfish wish is basically an 8th level, evil wish variant that is twisted – something that many a campaign does with regular wishes, but oh well. The cult also gets two decent, if unspectacular items – a defensive cloak and a gore-granting mask. The new monster would be the CR 12 flame-scourged scion, basically a fire-scorched dark young. The most interesting component here would be two leaders, an androgynous fey from beyond the stars and a super-potent goblin cleric. The next cult would be the first of an array of cults that depict a heresy of an established religion, which may require a bit more fiddling when using non-Midgardian campaigns, here a heresy of the god Baal-Hotep, deity of dragons and fire. The burning rune cult is led by one Ust-Ziyad, a potent CR 13 oracle and makes use of Midgard’s rune magic. The most interesting components here would be the Altar Flame Golem at CR 12, the new brenna-Þurfa rune and the ability to create timed scorch-bombs, which allows the GM to create some nasty death traps and evoke, through a fantasy lens, some modern anxieties pertaining our own safety in an age of globalized threats and urban guerilla warfare. While we’re on the topic of heresies, let’s talk about the other cults that can be roughly summarized under this moniker. The first of these would be the Night Cauldron of Chernobog, which, when summed up, can be thought of as radical adherents to darkness, with the ultimate goal of bringing the eternal night. With winter hags and a potent alchemist at the top of their food chain, their methodology does differ significantly from e.g. the burning rune – something that also holds true for the third heresy in the book, but I’m getting ahead of myself. The rank and file members also deserve special mention here, making interesting use of the vast array of NPC-races. As far as supplemental material is concerned, we get a poison that causes both blindness and Wisdom damage and a spell that “…if it gained the phantasmal creature template (Midgard Bestiary) at 50% real.” Yeah, that’s not how this is usually worded; flipping up my Midgard Bestiary, the reason becomes pretty apparent: The template distinguished between different degrees of reality. Still, the spell proceeds to talk about “effectiveness” and non-rules-language entities, instead of concisely summing up the benefits of the template. RAW, this is not functional and really wonky to implement. The new items include a darkness-causing lamp (Seen those before. Often.) and an interesting dirk that renders the target incorporeal as well as potentially staggered, which can be rather intriguing. The write-up also includes a minor artifact, the bituminous orb, which fortifies against positive energy, and which may cause enervation as well as a 1/day Str-draining buff to CMB and CMD. Once more, the rules-language here isn’t perfect. On the plus-side, we do get a cool occult ritual that represents the followers undergoing a transformation into beings more aligned with shadow. I really liked that one. The CR 6 contaminant shade is a more devious take on the shadow, which I found myself enjoying. The third heresy of sorts would be one that should be familiar to fans of Midgard in PFRPG – Selket’s Sting. Now, the thing that sets this heresy apart from the previous ones would be pretty obvious – the cult is presented in a manner, where the PCs may actually be servants of the cult. It adheres to a quasi-Egyptian leitmotif and represents basically a religious secret police that executes those that violate Selket’s divine mandate. Now, I have already covered this cult in my review of the Demon Cults-series installment, originally released as stand-alone pdfs to supplement the massive Southlands book. In fact, this book, apart from its new content, acts as a compilation of sorts for the previously-released PFRPG-Demon Cults-series. This means that the Sword & Sorcery-themed cabal dubbed the Emerald Order of Thoth-Hermes, the somewhat generic order of antipaladins called Doomspeakers and the cool, highly uncommon crime-syndicate Hand of Nakresh can be found herein. Similarly, the Servants of the White Ape under the command of their potent summoner overlord can be found within the pages of this tome. Since I have already covered all of these in excruciating detail, I’ll just point you towards these reviews instead for the details – just click on the “Demon Cults”-tag on my homepage, and you’ll have them all conveniently listed. There are quite a few new cults beyond these, those – for example, the Chosen of the Demon Bat, who represent, at least at first glance, the servants of Camazotz. Led by a derro alchemist and a masked oracle, with an advanced fungal cave giant, the cult’s elite is interesting and we even get a unique CR 18 demon bat, Vespertillo – once a high-ranking servant of Camazotz, the mighty demon has been exiled to the material plane and an unholy alliance with the mi-go! This makes the overall feeling of the cult rather distinct. The cult gets a decent, if somewhat unremarkable feat that nets a bonus to concentration when injured while casting. We also get a new hazard with fungal pods and a variant form of strange spellbook with the ebon shards. The cult also gets a thematically-fitting staff as well as magical lenses and there is a new swarm, a poison that renders you unconscious and a spell that calls forth bats or birds to act as spies. Two vehicles are included, the fungal flyer and skittering skiff. I liked this bait and switch approach to a cult that starts as straightforward and adds a complicating twist. The Creed of All Flesh is tied to the concept of the intelligent darakhul ghouls in Midgard and their subterranean empire…and those mrtals that crave the flesh of their brethren. Considering how cool the notion of darakhul is in the first place, it should come as no surprise that I consider the darakhul-themed cult as depicted here and interesting. On a mechanical perspective, I liked the notion of a DR that can either be bypassed by magic or while in daylight, and the options previously presented in Midgard supplements that are copiously used in the NPC builds help to set them apart. The execution of the respective campaign-sketch is also pretty damn creepy, so yeah, theme-wise, a resounding success as far as cannibal cults are concerned. With magical broths and jerky, a mace-like rod that can attempt to swallow and bite creatures and a nasty tome, these are nice. I am particularly partial to the lavishly-illustrated Greater Festrog mount-undead. One of my favorites herein. Speaking of the living dead: As you all probably know by now, the Red Goddess Marena would be one of my favorite deities in Midgard; in the vampire-rules principalities of Morgau and Doresh, her worship is open and serves to justify the vampiric rulers; in essence, they are a sort of anti-Catholic-church, one based on a doctrine of tainted life and suffering as a promise for an elevated existence beyond the shroud of death, though here, it is not in some afterlife, but as a reborn vampire. Combine that with elitism and the notion that the deity has elevated the worthy and we arrive at a nice blend of the, by today’s standards, concept of divine providence for rulers and vampiric themes. Marena also has covert agents, the blood sisters, who act beyond the confines of the vampire-ruled home-bases of the cult. (As an aside: Evil blood-magic nuns are just badass…and with the stats herein, you can use Kobold Press’ “Blood Vaults of Sister Alkava” with minimal fuss – the stats of the sister are included herein, alongside a potent vampire mesmerist, the stats for the church’s Grand Inquisitor…and yes, before you ask: Marena is also a goddess of lust. Her servants thus control brothels…The cult also includes two new blood magic spells to add to the arsenal presented by Deep Magic, the sanguine spear, a spear of frozen blood drawn from the dead, and the stigmata of the red goddess, which causes bleed to the caster, but also buffs. The incantation bloodline strike is amazing: Capture a target of a bloodline and make it thus a conduit to target other members of it. Classic and well executed. An dagger to exsanguinate and a magic scourge complement the supplemental section. The monsters associated with the cult include the blood familiar and blood zombie templates as well as the blood pudding creature. The final cult within this tome would be the weavers of truth, which may be the last cult herein, but certainly not the least: The cult is devoted to Pazuzu and basically acts as a magical think-tank of firebrands and misinformation, with deception-focused clerics, charlatans and the batlike echo demons making them a formidable cabal of adversaries that probably will need to be fought less with blades and more with roleplaying. This is in particular represented by the absolutely glorious Incantation of Lies Made Truth, which can make for an absolutely mind-boggling twist as an occult ritual. I also absolutely adore the carriage of whispers, a hybrid magic item/vehicle that allows a passenger to influence those it passes – which can make for an amazing showdown, in which the PCs turn from celebrated heroes to outcasts, as a whole city suddenly becomes ever more hostile, but this has VAST potential in my book. Editing and formatting on a formal and rules-language level are very good, if not perfect: I noticed a couple of formal glitches, missed italicizations etc. as well as a few components where the rules-language could have been tighter. Layout adheres to Kobold Press’ gorgeous two-column full-color standard and the pdf comes fully bookmarked for your convenience. The pdf contains a ton of really amazing full-color artworks, though fans of Kobold Press may be familiar with some, but by far not all of the pieces. I cannot comment on the physical version of the book, since I do not own it. Jeff Lee, with additional design by Jeff Gomez and Mike Welham, delivers one massive book of interesting cults. While I do not consider all of the cults herein winners, particularly the doomspeakers and the Shub-Niggurath cult being somewhat less interesting than they should be, I found myself enjoying this book overall. In particular the Red Sisters and the Weavers of Truth make for some truly evocative and formidable adversaries, with the unique blend of the chosen of the demon bat coming in close behind them. I also found myself inspired by the cultists of the burning rune and my take on the old cults and new ones should by now be pretty apparent. In short: This is per se a very good book regarding its ideas and the plentiful statblocks for NPCs and monsters add further value for the GM. That being said, the rules-components beyond these left me less impressed. The antipaladin chapter, while okay, did not exactly wow me and the supplemental material stood out most when it focused on the story, rather than combat utility – the rituals and incantations are infinitely more interesting than the regular spells and items. In the mechanical aspect beyond NPCs/monsters, I’d consider this to be a 3.5 – 4-file, at best. However, the book, as a whole, makes for a compelling reading experience, with a ton of truly cool storylines to scavenge and modify and something for pretty much all tastes inside. While not perfect, my final verdict will acknowledge the book’s intended focus and cool ideas and thus clock in at 4.5 stars, though I can’t round up from that verdict.